Great analogue connectivity and great sound, plus the ICE-16 has some decent expansion options. High analogue I/O count. Top-quality conversion. Small, solid and simple. No option to drop track count at lower bit rates. This compact, lightweight and chunky package from Cornwall-based Allen & Heath brings simple, live multi-tracking to a lower price bracket. But at what cost the reduced price? The layout of buttons on the front is fairly intuitive, but the lack of menu system means you'll need to reference the manual to know the combination of button pushes to change settings. There are no gain trims, but in practice, the gain structure of the unit means they are not missed. "It has both USB and Firewire 400 sockets, making connecting different types of computer a breeze"
On the back, the first thing to jump out is the choice of I/O connectors. The restricted space means A&H have gone for jacks for inputs and RCA phonos for outputs. 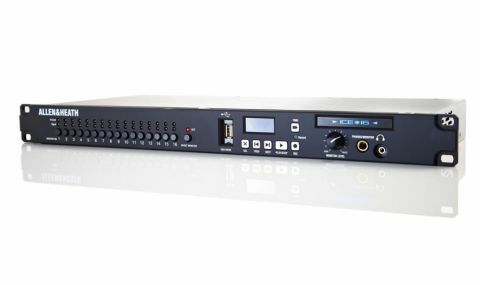 It has both USB and Firewire 400 sockets, making connecting different types of computer a breeze, and also a multipin connection, which means you can sync two ICE-16s to make a standalone 32-track. The lack of digital I/O may not please some - the ICE-16 is obviously aimed at those still in the analogue domain - but the possibilities offered beyond multi-track could make some digital desk users envious. Connecting USB media to the front panel bypasses the USB/FW connections, and puts the unit into standalone mode. It will then test the media and inform you if it is fast enough to run at higher bit rates. In USB mode it is only possible to record in 16-track (up to 48kHz) , or eight-track if you choose to run at 96kHz. It's a little frustrating that USB recording has no option to drop track count at lower bit-rates. Many set-ups will result in a lot of empty WAV files. You can obviously then play back multi-tracks off USB, and indeed stereo files for background music, and so on. To wire the ICE-16 in, Allen & Heath suggest using direct outs from the mixer for recording, but with most live mixers (and almost all A&H ones) this is post fade; changing it to pre is not possible without a service engineer. Switching from recording to playback often means swapping 16 connections. We ended up making some custom cables to make use of the channel insert send. In USB mode the outputs do nothing while recording; it would make life much easier if there was a latency-free hardware monitor option, each output echoing its input on recording. The ICE-16 could stay connected at the insert point, and changing from record to playback would be no sweat. "The ICE-16 can be expanded by syncing a second unit in standalone USB"
The ICE-16 can be expanded by syncing a second unit in standalone USB. With a PC, two can be simultaneously used on Firewire, but not USB. This expansion goes further when using it as a soundcard. The drivers go on painlessly - they are implemented by Archwave, who make drivers and chipsets for some top soundcard manufacturers (most of whom have the software rebranded with their own logos). We've tested many soundcards on our system, and all that use these have given us noticeably better reliability and latency than most. The sound quality more than meets the expectations given by the ICE-16s impressive specs. Unlocking the most exciting potential of this hardware can be achieved by installing one of a range of low-latency VST host applications. Most DAWs are too big to offer speedy enough latency to make this practical live. Testing with Xlutop's Chainer app on a WinXP machine, I was able to reliably achieve sub-2ms latency. We engineered some small live shows with very basic mixers using this set-up. Adding 16 channels of surgically precise VST processing with the ICE-16 and a laptop gave incredible results considering the size, weight and cost of the whole system. The ICE-16 might not be to everyone's taste, but some live engineers will love the possibilities offered by this chunky and simple hardware. It could see some staunch analogue Luddites embracing the enemy and integrating digital audio to their analogue domains.